After work is when you build your future. Since we are in a retrospective mood following Marin's last FN, I will also jump on that mental bandwagon and share some thoughts on the year that passed. In particular, why putting in the work after work has made it possible to continually move the needle in terms of building a business and a brand while keeping a full-time job. 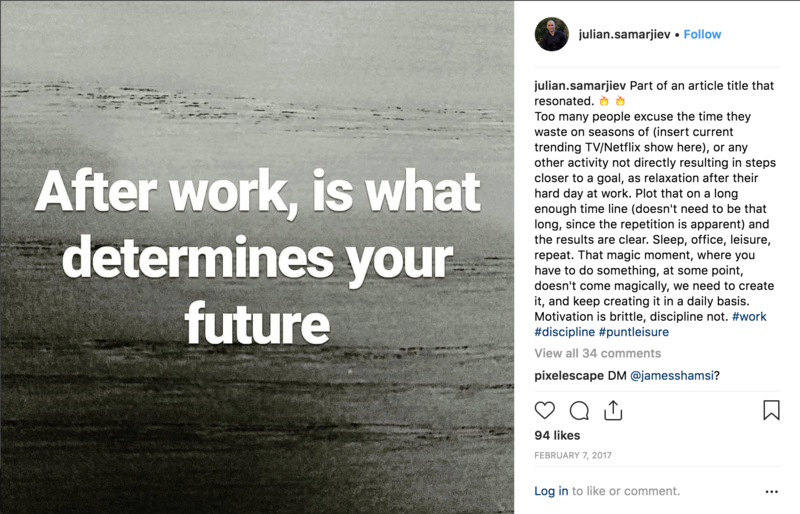 What I wanted to say here is that the hours at the office are merely enough to keep a career going, not excel at it or build a successful business on the side (that can eventually become your full-time job). The way I see it, every hour invested after work in your project is another brick in the foundations. If you are not regularly laying bricks, projecting that behavior forward in time, there is no way that you'll have enough bricks to work with. I say this with the understanding that all of us have a varying degree of motivation, discipline, vision, and goals. Nevertheless, if your ambition is bigger than passively climbing the company ladder after work is when you build your future. 30 minutes, 1 hour, 3 hours, it's all bricks, small and big, they are all valuable and they all add up in the end. Copyright © 2018 DULO Wear, All rights reserved.